WHAT: Commemorative ceremony for the air and ground crew who served in Bomber Command during World War II. Their sacrifices and inspiration must never be forgotten nor dimmed by time. The debt we owe those who served in Bomber Command is beyond measure. A similar Ceremony will be held in Canberra on the same day and at the same (local) time. Other capital cities in Australia, London, Canada and New Zealand will hold appropriate Services during June. WHO: All who wish to commemorate those who served in Bomber Command. 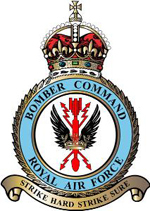 This annual ceremony is an opportunity for all to honour, pay tribute and to recognise the sacrifice and service of air and ground crew who served with pride and distinction in Bomber Command. We collectively can remember with pride and gratitude those who have died in service and those who have served and are no longer with us. WHY: In September 1940, Winston Churchill said, “the fighters are our salvation but the bombers alone provide the means of victory”. These words are carved on one of the walls of the Bomber Command Memorial in Green Park, London. Between Dunkirk in 1940 and D-Day in 1944, Bomber Command, later supported by the American 8th Air Force, provided the only continuous strategic attack against the German Forces on the western front. They were the spearhead in defeating the enemy both by destroying the German’s war materials manufacturing capacity and forcing the Axis powers to divert significant resources in men and armament to defend their cities. Their devotion to duty laid the foundation for D-Day and preserved for us the liberal democratic society which we enjoy today. Bomber Command embraced an air crew of about 125,000 men from most parts of the British Empire, France, Belgium, The Netherlands, Norway, Poland and Czechoslovakia. Ten thousand were Australian. GUEST SPEAKERS: This year, Mrs. Paulina Nielsen, who served in the WAAF during World War ll, will give the Reflections Address on behalf of those who served as ground crew. Mr. Stan Pascoe, who served in Number 82 RAF Squadron, which was based at RAF Watton (Bodney), will give the Reflections Address on behalf of Aircrew. ACKNOWLEDGMENT: The Organizing Committee wishes to acknowledge the support from RAAF Amberley, The Department of Defence, The Women’s Auxiliary of the Ipswich RSL Sub Branch and the voluntary participation of the Amberley Brass and the Blackstone – Ipswich Cambrian Choir. FURTHER INFORMATION: Please contact either of the following for information and/or registering your intention to attend. As this service is held in a secure area, registration to attend is imperative.